Softly falling and delicately lacy snowflakes are a peaceful and beautiful site during the winter. When snowflakes are falling, the environment seems softened, bright, clean and quiet. As fresh snow softly blankets the ground it glistens from the light. It always feels more like Christmas time with snow. This pattern for snowflakes is a great way to capture the delicate beauty of snowflakes that will shine from the Christmas lights. This bead snowflake pattern is an inexpensive and easy Christmas ornament to put together; which makes it great for a group or family activity. These homemade Christmas ornaments also make nice gifts to give to others, or keep them for your own Christmas ornament collection. 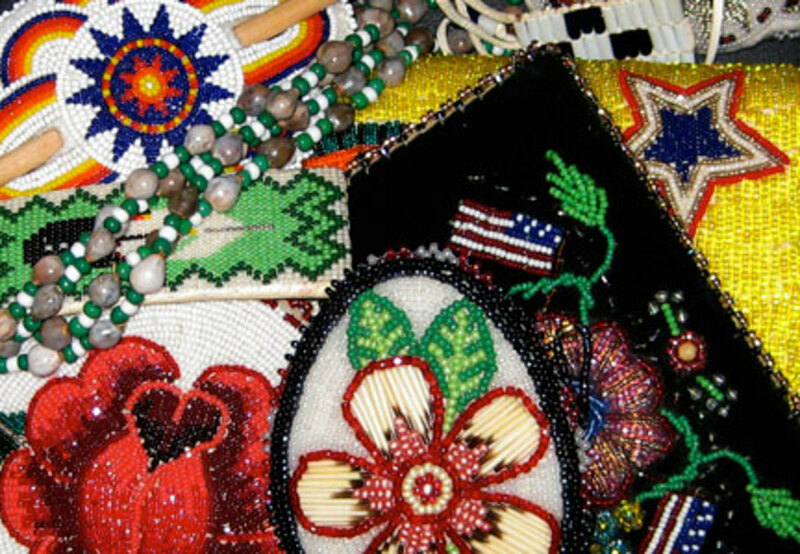 First, select three colors for your beaded snowflake ornament. 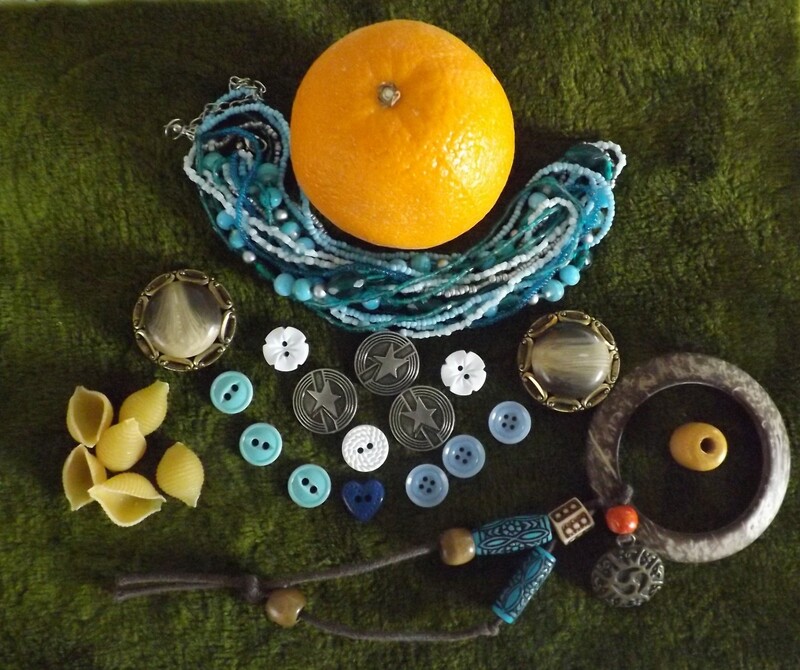 For the one I’m making here, I have selected to make a bead snowflake set in blue tones. I choose blue tones because I like the cool icy look it creates. The three colors I have chosen are dark blue, light blue and clear. Utilize the images provided for visual help through the steps. 1. To begin, take the three 4” sections of the craft stem and lay them over each other, with the center points overlapping, to form a six point star. Take one of the 7” strands of thread and tie the three stems together directly in the center to secure the star formation. Leave the long ends of the thread available as you need them for the next step. 2. 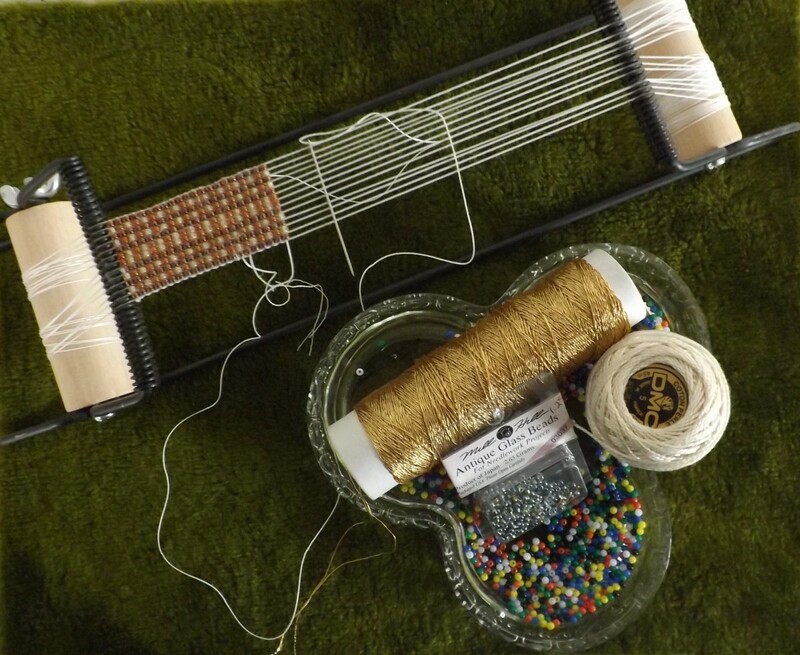 Take one of the remaining ends of thread and feed it through a starflake bead then through one faceted bead. 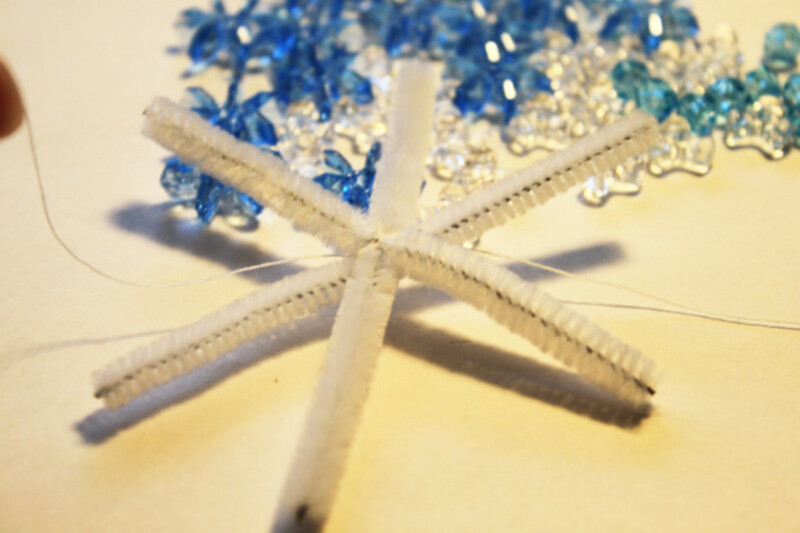 Take the end of the thread and feed it back into the starflake bead and pull the beads against the center point of the bead snowflake formation. 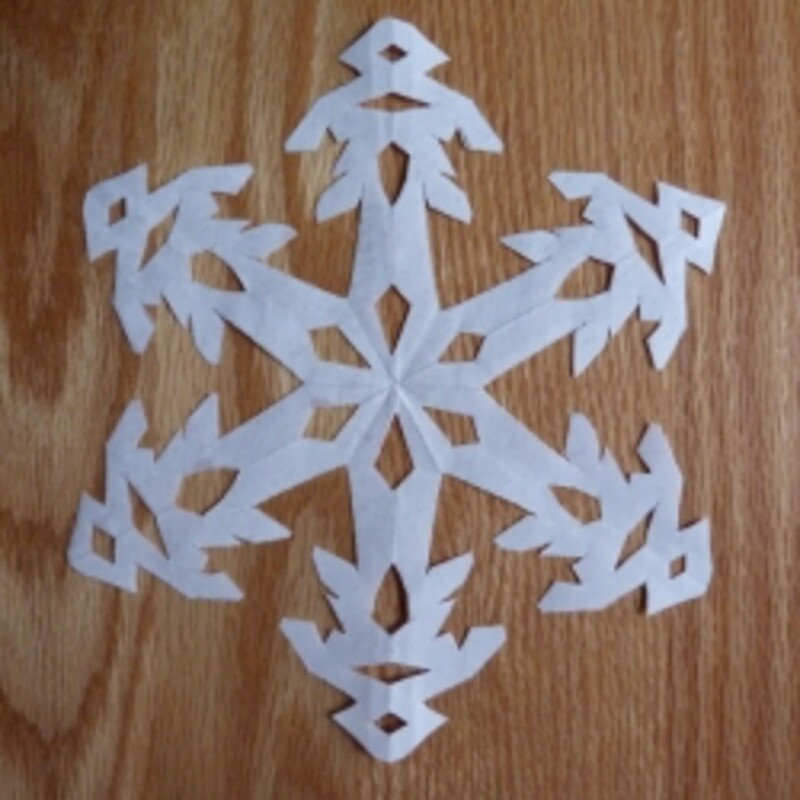 Turn the snowflake ornament over and repeat the process with the other end of thread by threading one starflake and one faceted bead, then back through the starflake. 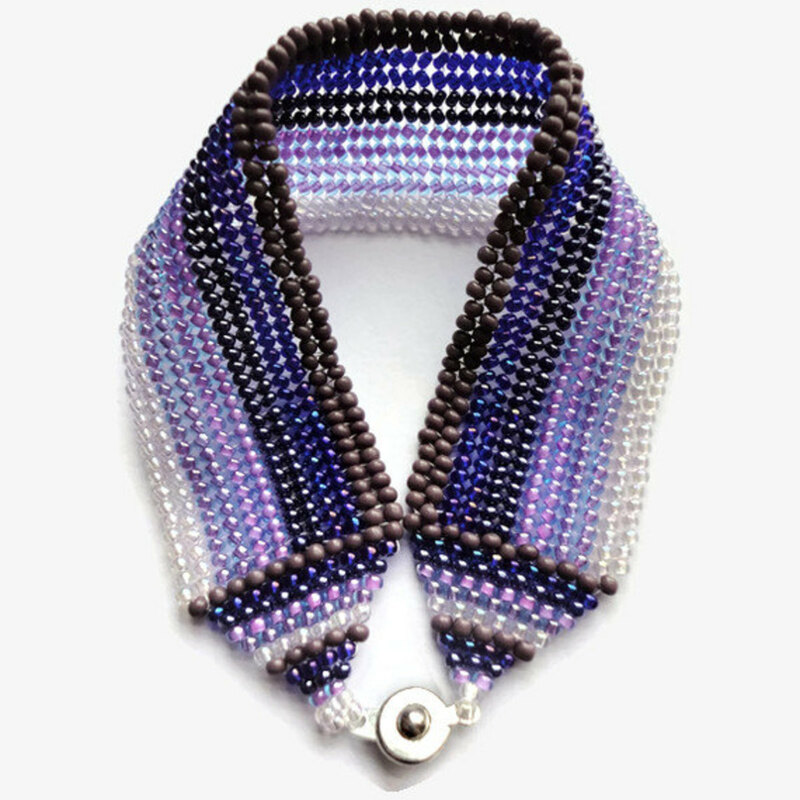 Take both of the remaining ends of thread and tie them tightly into a knot, securing the beads in center of the formation on each side. Cut of the remaining ends of the thread. 3-6. 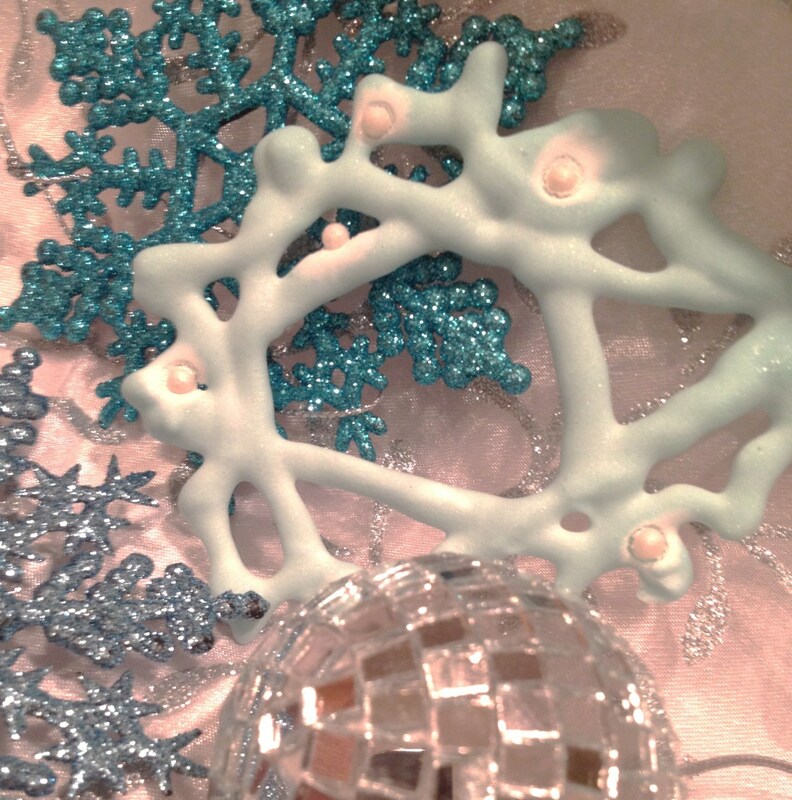 The next step for this snowflake beaded ornament is to slide one faceted bead onto each of the six stems. Next slide two tri-star beads onto each of the six stems. 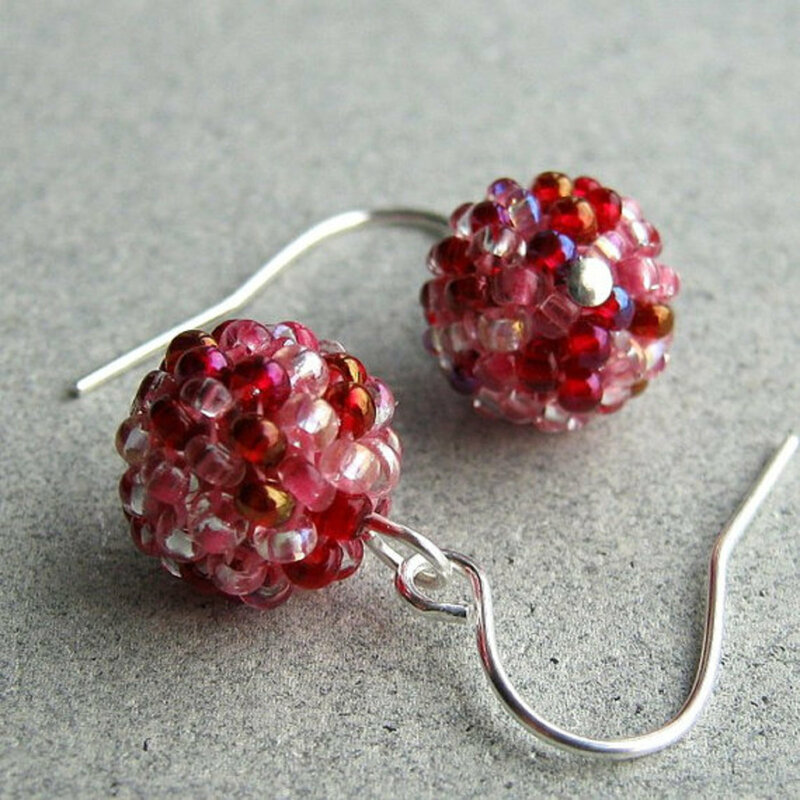 Now slide two starflake beads onto each of the six stems. 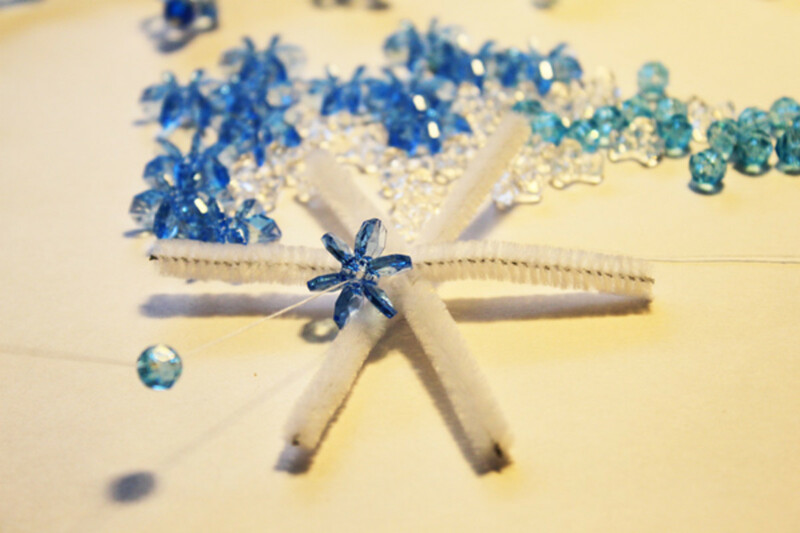 Then slide two tri-star beads onto each of the six snowflake stems. 7. 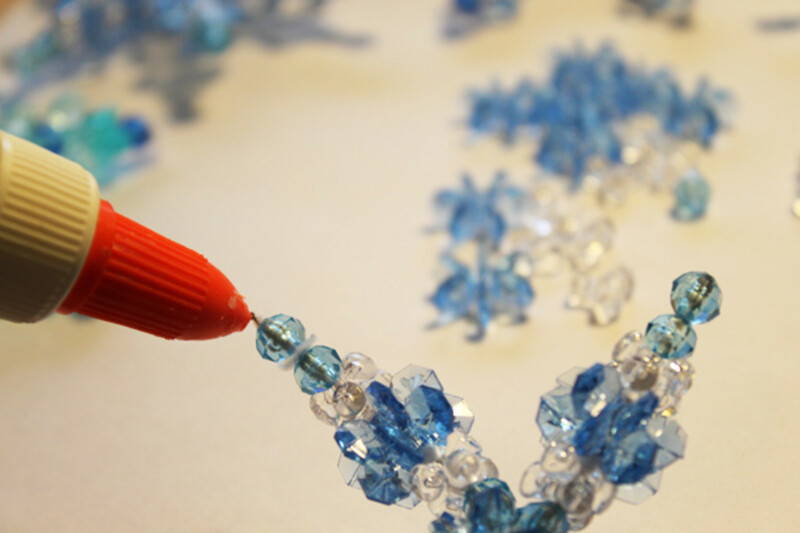 Put a dab of glue onto the ends of five of the stems of the beaded snowflake pattern before placing on the final two faceted beads. This will secure the beads in place. On the one remaining stem put a dab of glue on the end and place one faceted bead onto the snowflake ornament stem. 8. 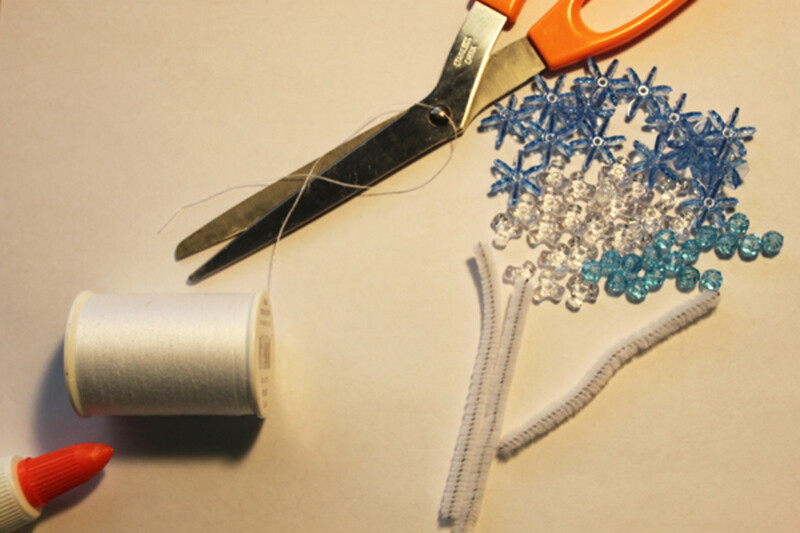 Take the last 7” piece of thread and tie the ends together to form a loop. Now secure the thread loop around the stem, by pulling one loop end through the other loop end of the thread and pulling tightly in place around the beaded ornament stem. Put a dab of glue on the end of the remaining stem and place the last bead on the end of the beaded snowflake stem. If you have some excess stem sticking out of the homemade Christmas ornament ends, clip them off with wire cutters or scissors. 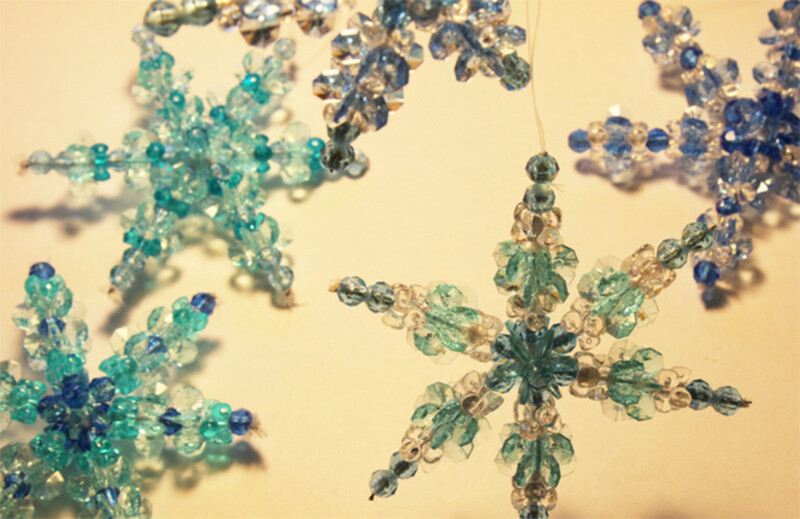 No two snowflakes are a like, so you can also make each of your bead snowflake arrangements different to alter the look for each beaded snowflake pattern that you create. 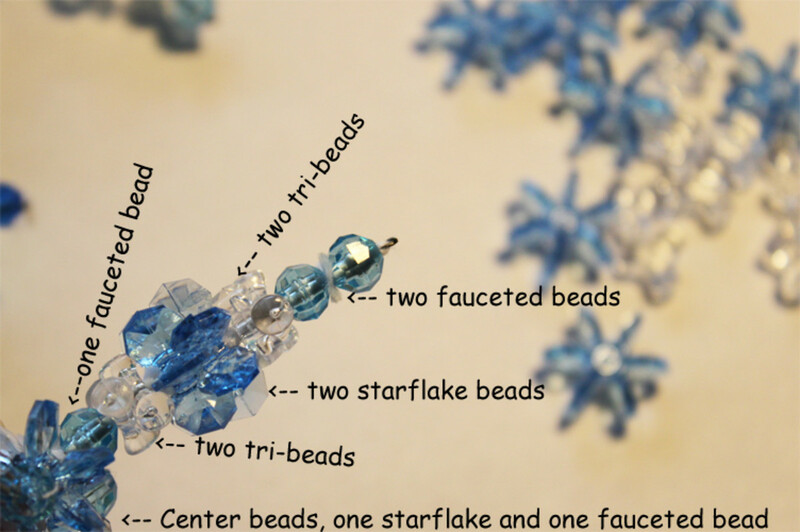 Study the images at the top and bottom of this hub for some snowflake bead pattern ideas. You can also alter your color combinations. Previous combinations that I have used for sets of this beaded snowflake pattern were pink, champagne and clear; which turned out very pretty. I have also used a combination of light blue, champagne and clear; which created a Victorian lacy look. These are just a few examples of color combinations that I have used. 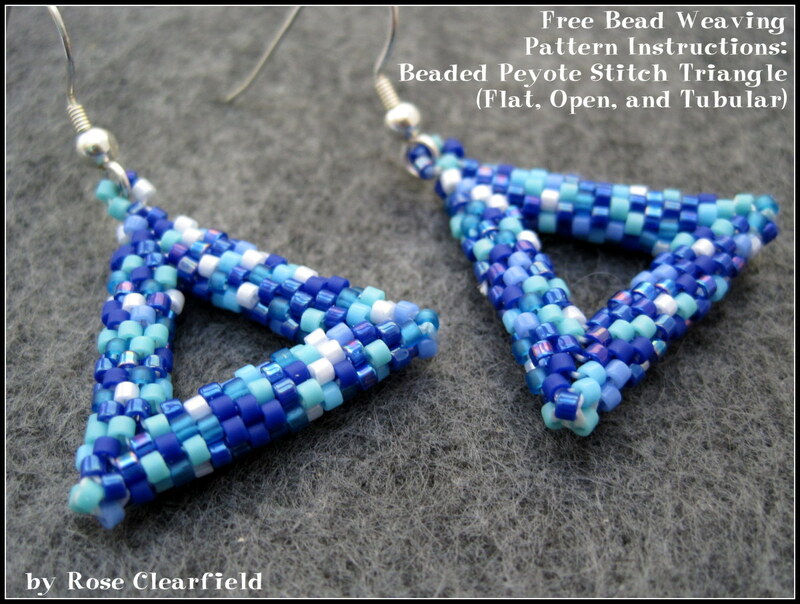 The point of this is to get creative, try matching up different color tones and bead arrangements and create your own bead snowflake combinations. Though beads can be purchased in individual colors, I enjoy getting these multi-colored packs. These provide me with a variety for any craft or mood! The basic round Christmas ornament is the most commonly shaped ornaments you can find. But that doesn’t mean that they are any way boring, especially if you have unique homemade Christmas ball ornaments hanging on your tree. A fun and easy candy cane crafts for all ages, this beaded candy cane pattern makes for delicious looking homemade Christmas ornaments that make a great addition to any Christmas tree. An easy peace ornament bead craft that can be done for Earth Day, a 60’s-70’s/hippie theme party, or just for those who are a fan of the peace sign symbol and bead craft projects! gorgeous! Can't wait to make these with my kids over the holidays. Thank you so much for your kind comments Just Ask Susan & DeborahNeyens . Of all my ornaments, these are still my favorites. I make them nearly each year for others as gifts. These are beautiful and I'm hoping that I have the time to make a bunch of them for my tree this Christmas. I love handmade ornaments and beading. Pinning this. Thanks for sharing. Wow!! this is soo lovely! I love snowflakes and I really love your hub! Easy Exercise, I think this craft would be very fun to do in a group activity. I hope it goes very well for everyone. Thank you for your visit. These are very pretty. I bet a tree full of these would be gorgeous. You've done a great job giving simple-to-follow instructions. Wow! I love this! I head up children activities at my church and this would be perfect for our volunteer who heads up crafts - I will print and retain for next years program - we already have the pipe cleaners - only need the beads and your instructions. Thank you very much! Thanks for visiting and commenting Lori. Loved this so much I also shared it on my facebook fan page. It's so pretty! Those are very pretty. I have a few beaded ornaments I hang on my tree every year that I bought at a craft sale over 20 years ago. I attempted to make my own, but the ones I bought were much nicer. It is a project I would attempt again now that I am older, wiser and more patient. A wonderful tutorial hub! 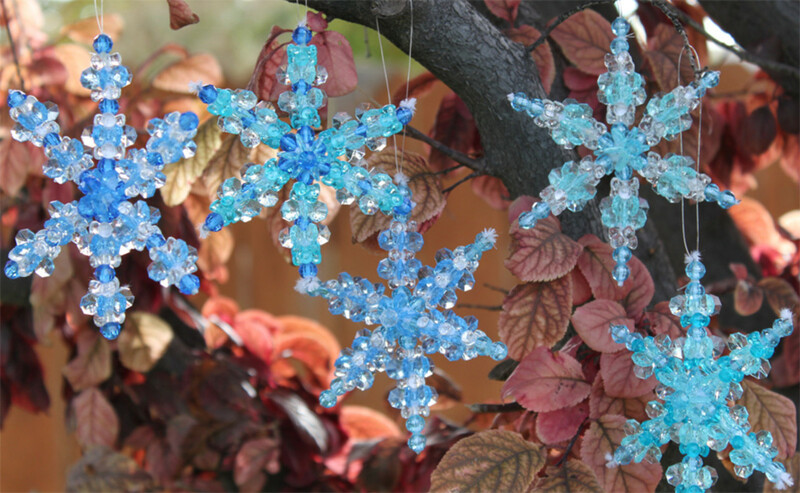 Your beaded snowflake creations look very pretty and obviously, they make stunning Christmas tree ornaments. Your instructions are detailed with helpful photos. Well-done! These are beautiful! I'm going to have to give them a try. Pinned! Those are beautiful, I bet they really add sparkle to your tree. Great hub, voted up and shared.